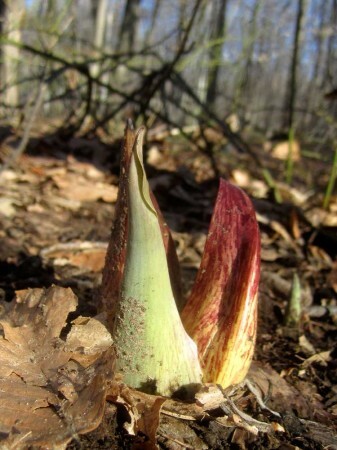 Even though February seems to be a pretty bleak month, it is the time of year when you will find strange, exotic blossoms appearing throughout the woods and marshes – the flowers of the ubiquitous skunk cabbage (Symplocarpus foetidus), those large, lush, leafy plants that inhabit almost every marshy, woodland area in the Eastern United States. Yet as common as these plants are, very few people ever get to appreciate their unique flowers. 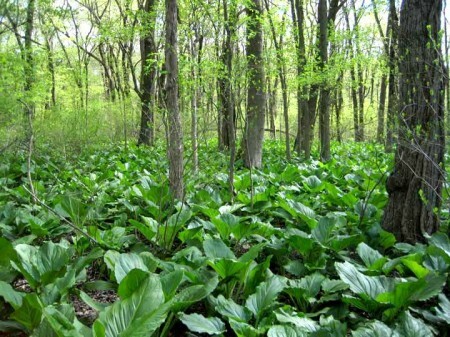 Most of us have seen patches of leafy skunk cabbage in the damp woods. They looks so tasty, that I’m sure that many have been tempted to eat them. However, if you crush a leaf, it has fetid odor similar to skunk, which stops many people from putting it in their mouths. This is just as well, as the results of doing so would have been quite regrettable. The immediate skunky taste isn’t that bad compared to what comes next. Within seconds it is as though your mouth is full of very sharp needles that are being repeatedly stubbed into every bit of soft tissue. It feels like you just licked a cactus. They say that it becomes edible after it has been dehydrated. However, this can be very chancy, because if you don’t COMPLETELY desiccate it, the Calcium Oxylate crystals will still be active and you know what happens next. I know that I wouldn’t that chance? You won’t find any skunk cabbage in my dehydrator. 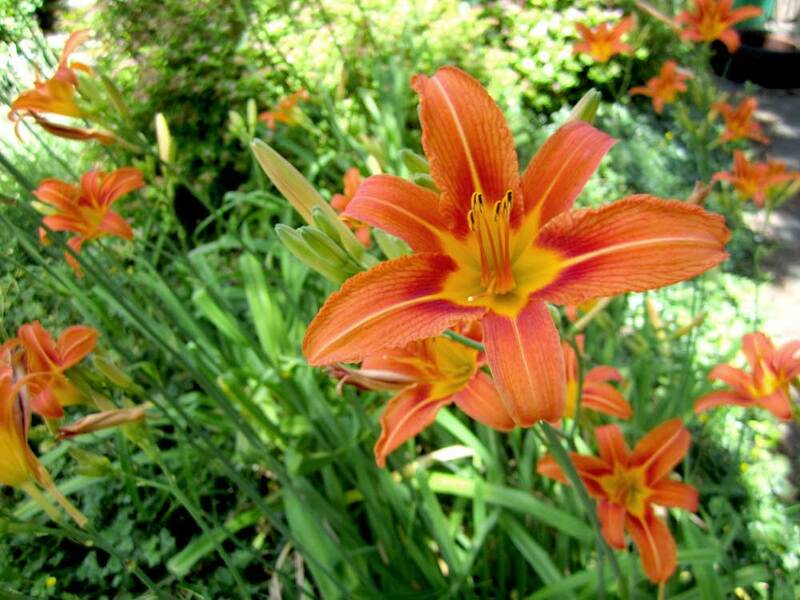 The colors and patterns vary from plant to plant, ranging from greens to yellows to reds. 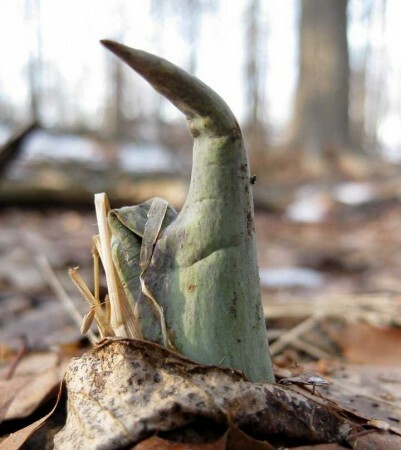 Although they are not edible, the late winter blooms are worth making the effort to find. You’ll need to put on a good pair of boots and make your way into the nearest bog. 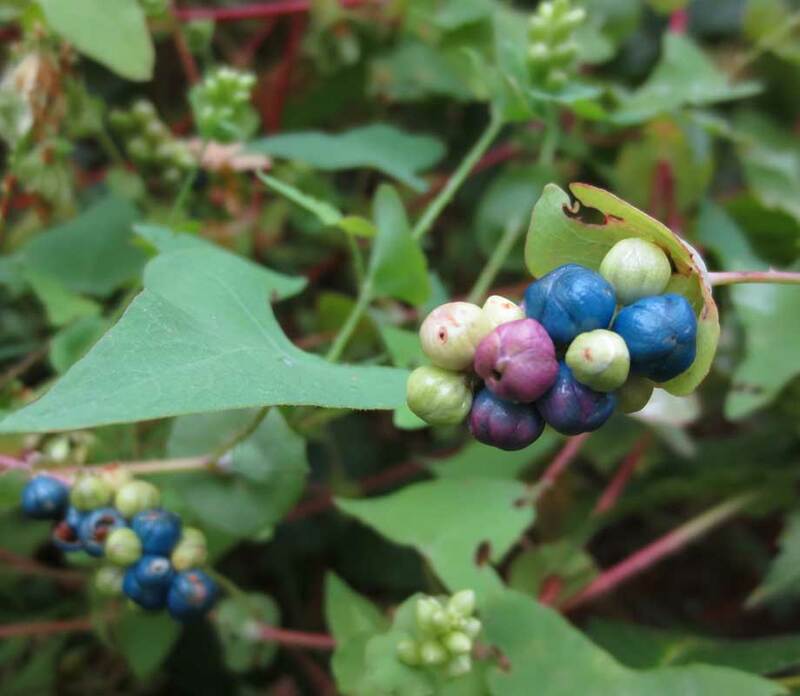 Once there, start looking around for the colorful pod-like blooms breaking through the leaves and moss. These leafless flowers may be hard to spot at first, but once you recognize one emerging from the mud, you’ll begin to notice more. They vary in size, shape and color, each with its own personality. They grow singly or in clusters and are often in shallow water. 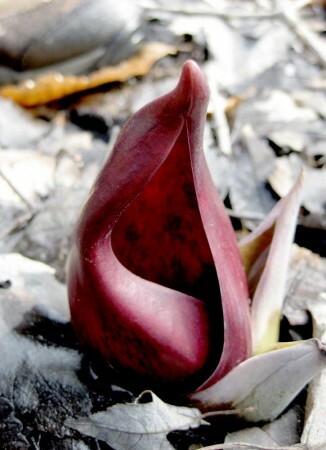 A rare example of a skunk cabbage flower with a single, solid tone. If you look carefully at these pointed capsules rising like alien beings out of the mud, you’ll notice that they guard a secret within – a ball of pollen bearing florescences that looks as though it belongs on a coral reef. This round to oval cluster contains several large seeds, which are deposited back into the mud after the capsule shrivels and disintegrates. inside the protective spathe is a ball of the actual flowers, that contains the seeds. 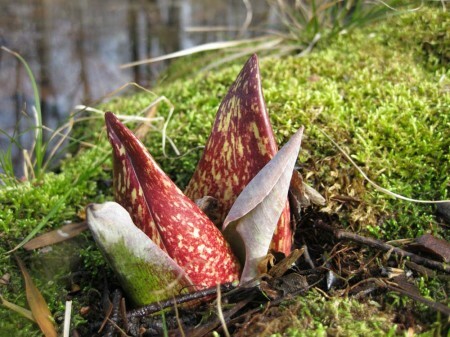 Skunk cabbage is what is known as a thermogenic plant. It can adjust its own body temperature, such that it could be upto 50 degrees warmer than its surroundings. This becomes apparent when there is snow on the ground. 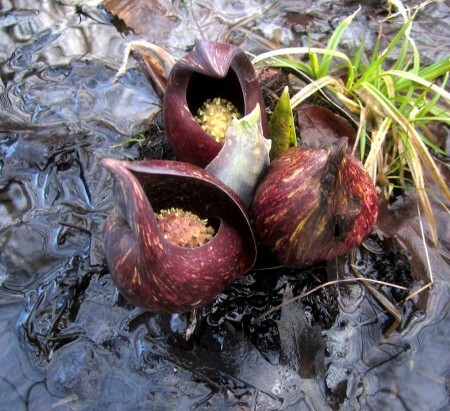 You will notice the skunk cabbages sitting at the centers of melted holes. 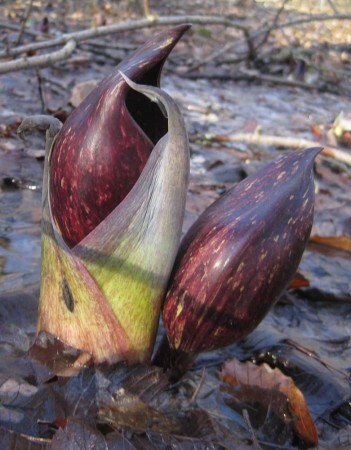 This allows them to send out their somewhat fetid (skunk like) aroma to attract flies that seek the warmth of the encompassing spathe that makes up the outside of the flower. They will often pass the night in the warm interior, inadvertently gathering pollen along the way, which they carry to the next flower they visit. 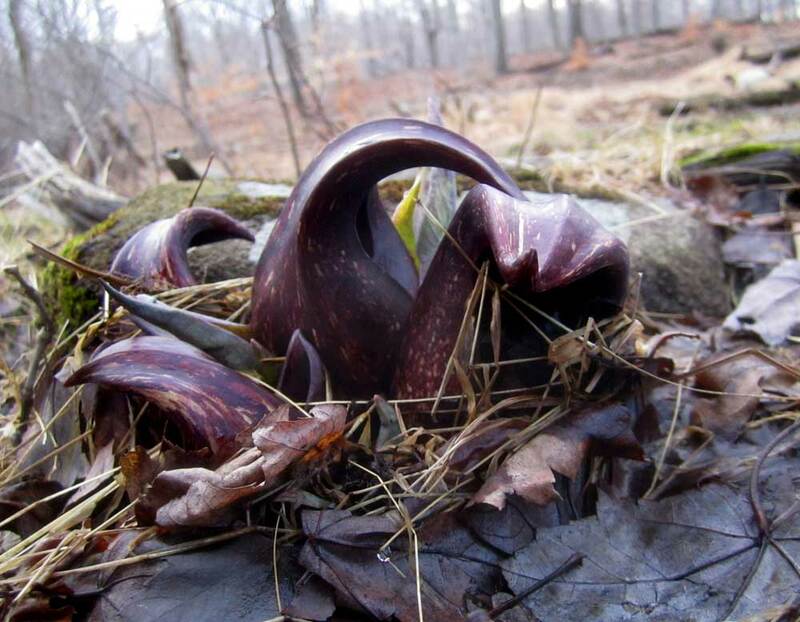 If you were to dig the roots of a skunk cabbage, you would notice that it resembles a multi-legged octopus (a polypus, in fact) with ridges along the tentacles. These strange ripples allow the roots to pull the plant deeper and deeper into the soil as it grows bigger. I dug one up once (a very mucky experience). It took a lot of digging to get it out whole. It’s a good job it was buried in wet mud. It was messy, but at least I didn’t have to wrestle with roots and rocks. As it was I ended up spattered with smelly black goop.